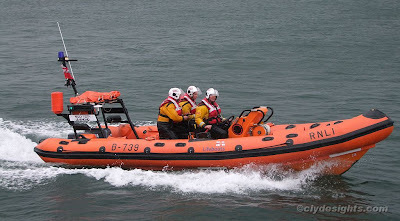 The Largs inshore lifeboat PEGGY KEITH LEARMOND was launched on Friday afternoon, after a vessel that had been anchored off the lifeboat station was seen to be dragging its mooring. An Atlantic 75 class boat, it was new in 1998 and has been stationed at Largs throughout its life. The 7.5 metre boat has a top speed of 32 knots, and like most inshore lifeboats, is beach launched. They were called out to the Port Bannatyne Marina earlier!